I've had this Scherer Chameleon polish in my collection for ages and I've never ever used it. I had heard horror stories about the formula, so I just put it in a drawer and forgot about it until a few weeks ago when I saw it and thought... Hey, what the hell... Let's try it. Scherer Chameleon Blue Sky. You know what? It turned out to be GREAT. I honestly had no problems with the formula or application; it was nice and smooth, not too runny, surprisingly opaque. Blue Sky is a chrome-like periwinkle blue with purple duochrome when I look at it straight on. Changes in angle reveal darker blue, teal, green and a faint hint of gold multichrome on top of the blue chrome base. It's a bit frosty, but as it dries it appears more chrome/metallic than frost. I did three super thin coats. It has a very dense yet strangely thin feeling (but not runny or watery) formula. It dries so flat and thin that at three coats it still felt like there was nothing on my nails. Dry time was amazing, lightning fast. I've always heard that these were awful so I was really pleased and surprised at how well this applied and how very multichromatic it was. I have a couple other Chameleons that I've never used, but now I feel like trying them! This looks great! All your recent duochrome posts have really created some lemmings for me. :) Good for me, bad for my wallet. I'd love to see more of these Chameleons! Very nice, indeed! I'm really eager to see the other Chameleons (I never heard about this brand before, I think it's a US one). I absolutely love to use these in frankens for a little duochrome goodness! I have the same color and have yet to use it! Your post has inspired me! Soo funny.. I always pick this up at Rite Aid. Never buy it though! Not sure why, I think they're $2.99. They have some other shades that look decent.. will try one out next time! 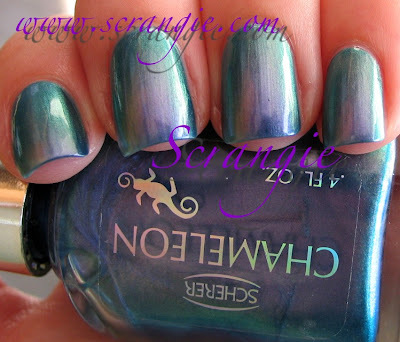 I just saw Cameleon when looking for some teals for Teal Toes Sept for Ovarian Cancer Awareness. it was a great duochrome med gray to steel blue shade - I think I will go back and get it now if it's still there. I am in LOVE, I have nothing like this in my stash. Can you please do the other polishes you have from this line? Just so we can be sure, LOL. Great post! Yes, please try more of these Chameleon polishes. I don't have any, but I'd LOVE to be able to drool over your perfect swatches of them and read what you think about them. My big issue with this polish (I have the same exact one) is wear. Even with my usual TC, wear was completely nonexistent! I could have looked at it the wrong way and it would have chipped. You're so lucky, maybe you got a good bottle. 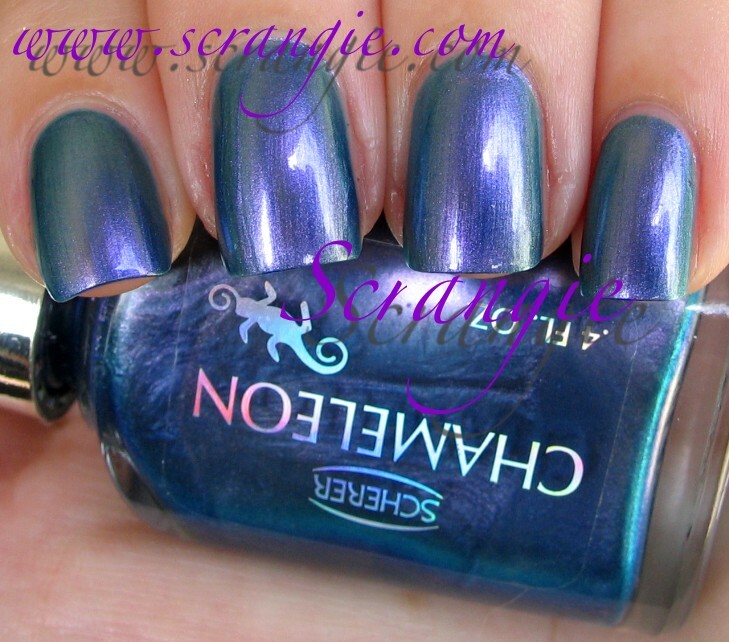 I saw the beautiful duochrome in the bottle and was so excited by it till I tried it... Then it was a horrible, gluey, thick, disgusting mess. Streaky as hell. Thinner did not help. Dried with a million bubbles. This was the first polish I ever threw out because I was so disgusted with it, and now I am regretting it seeing your photos! Sigh. I don't live in the US (I bought it on a trip there) so I guess I'll just have to learn to live without it! Love this color! I need to get some of these! I love this one! I have multiple back ups >.> I really don't know why some people have trouble with them, maybe it is a matter of luck, some bottles have good formula and others don't? I have had good luck with my bottle of Blue Sky too, always wondered why nobody ever talks about these polishes. I think they're lovely! I love this polish! It is so unique and looks soooo good on your nails! Gotta laugh, I threw mine out too! Tried to pawn it off on both my daughter and my mom, and neither one wanted it. Thin, streaky, chippy mess. I much prefer Rite Aid's CQ polishes. Plus you always have to watch Rite Aid's sale prices. Every single time I've been overcharged. BOGOs rarely come up unless you're buying 2 of the exact same item. I was also overcharged on this week's 40% off WNW sale, as several of my items came up 33% off and I didn't catch it till I was home. Yeah, it was only $.40, but how many times did they collect those little overcharges? I've never heard of this brand before. It is beautiful. Love how it changes with different positions of your fingers. I have one of these, possibly this shade, and while application was ok, I had TERRIBLE wear issues. It started chipping almost immediately. Even changing shirts was enough to cause a chip. I loved this company polish but now hate it. It chips easily and I cannot remove it!!!!! And I tried every solvent in the house....remover, alcohol, peroxide...you name it!! I am also leery that I cannot seem to find a web site for the product!!! !